Axel R. Cerny grew up in the DuPage County community, attending Wheaton Academy in West Chicago. Following graduation in 2006, Axel attended Liberty University in Lynchburg, Virginia and received a Bachelor of Science degree in Communications/ Journalism studies in 2010. From there, Axel returned to the area to study at The John Marshall Law School in Chicago. He earned a Juris Doctorate degree in 2013, and after passing the bar exam was promptly hired to the DuPage County State’s Attorney’s Office as an Assistant State’s Attorney. There he worked for two years under DuPage County State’s Attorney, Bob Berlin, prosecuting criminal cases from the charging of the crime to the reaching of a verdict. His experience in prosecutorial litigation included proceeding to trial on over 70 cases, including 9 jury trials to verdict. 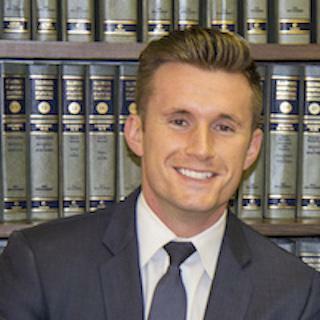 Axel joined the offices of Mullen, Winthers & Cerny, P.C. in 2015. He began focusing much of his attention around the areas of real estate law, family law, business/contractual law, and estate planning. In addition, he continued to expand on his years of criminal law experience with the DuPage County State’s Attorney’s Office. Axel’s extensive courtroom experience, paired with the knowledge he has gained, allow him to provide representation that clients can count on through every step of the process. Axel is an active member of the DuPage County Bar Association. He, and his wife Courtney are members of the Wheaton Bible Church in West Chicago, and Axel volunteers his time with young children in the community through the Awanas ministry.